(04-12-2018, 07:29 AM)SkyVinnie Wrote: Hi Guys i have just worked out how to get the nodes to auto connect on reboot / startup. I am a linux noob and have only just learnt how to use it for this project! This is what i have discovered. In the text editor enter. Scroll to the bottom of the page and enter. Repeat for all your other boards. Awesome post Vinny, I'd really like to get this going for my DIY Skyminer. I'm running 10 RPI 3B+ nodes and the setup is online. When I follow your steps I get the error E353: Nothing in register " (see screenshots). When I scroll up in the terminal I noticed that the '!/bin/sh part didn't show, even though I just copy/pasted it. Any clue how to continue? 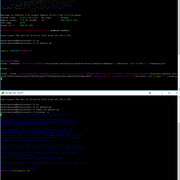 Vi can be qute annoying for people new to linux. I suggest replacing the command vi with nano. you might find it a little easier to edit the messages and copy paste. That said something when highlighting things on this forum my box randomly shrinks so I only copied half the line or half the code. That may have been what happened to you. are you adding this to the Raspberrypi pre made image tutoral? 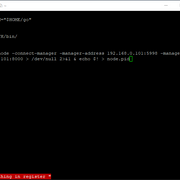 Linux newbie here, i just skipped the whole VI process and made a startnode.sh in windows and used winscp to upload all the files to every node and set properties to execute that way. much simpler. (Press the ENTER Key) then everything comes right up. I have attached a picture of the all the codes in the editors down below. Current time: 04-25-2019, 07:48 PM Powered By MyBB, © 2002-2019 MyBB Group.